We didn’t plan on being here. We met for early lunch hoping to simply chat the afternoon away. 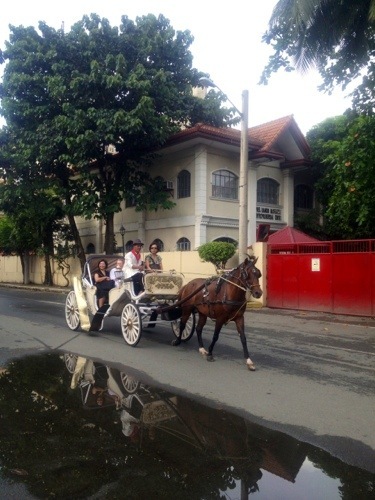 But why not chat while driving around Intramuros, much like those joy rides we used to enjoy when we were kids? Then the calesa passed right in front of us. It’s 2 o’clock in the afternoon and those riders didn’t seem to mind the heat nor the sun. Well, it wasn’t particularly hot this afternoon. 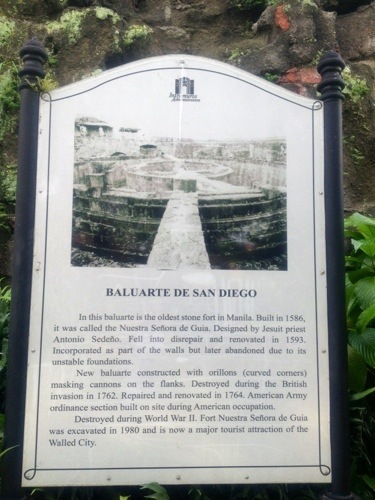 Pleasant enough to get off the car and walk into Baluarte de San Diego here in Intramuros. 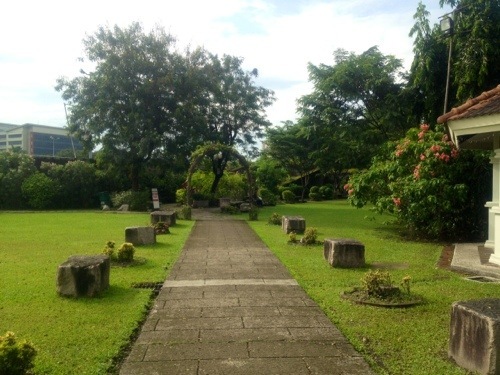 It’s a better option than the more open spaces in Fort Santiago. More shady trees too. 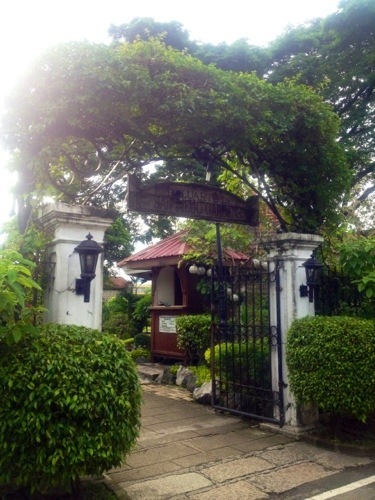 For only 75 pesos (less than US$2), one can get in to enjoy the “park with some history”. 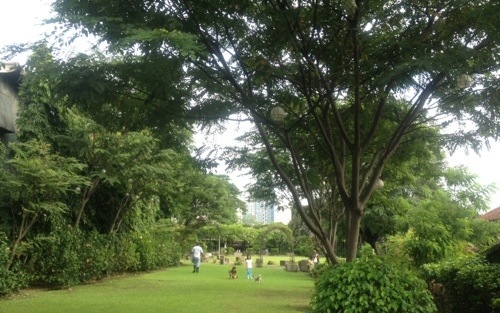 There were kids running around with their dog in the shady part of the Baluarte. Not many tourists. 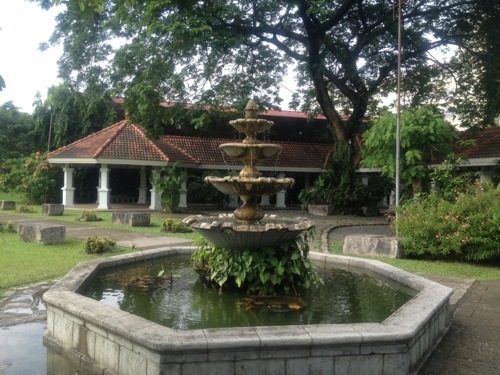 Many of them must be in Fort Santiago or San Agustin Church and Monastery. 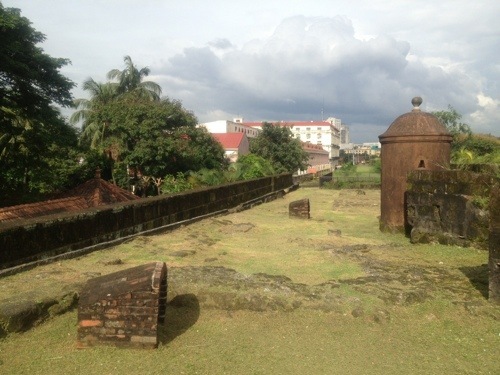 Yet this is one of the oldest stone fortifications in the whole length of the Intramuros walls. 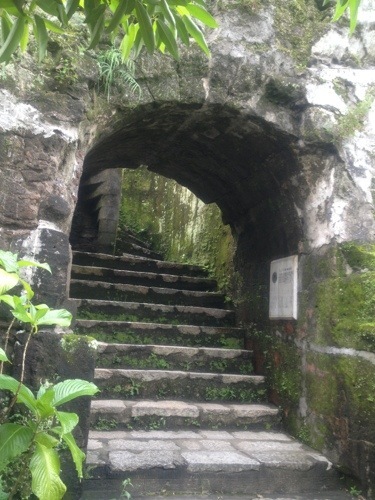 The old stone steps lead up to the walls from where one views this circular stone formation, the length of the walls, and the Manila Hotel and other modern skycrapers surrounding the walled city. I remember being here years back when I attended a wedding of a friend’s daughter where I stood as sponsor. I would have wanted to walk atop the walls, but my long gown got in the way 🙂 Today, there is no such restriction. 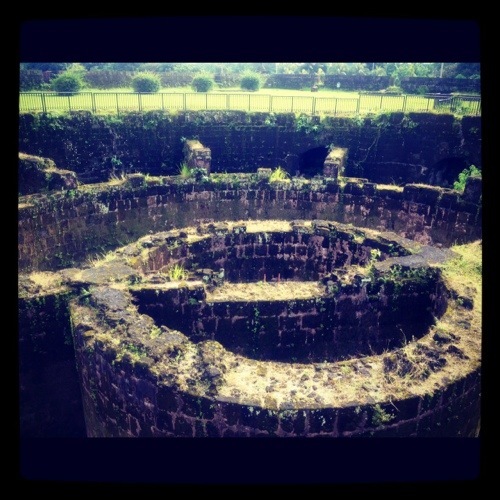 Will someone please tell me how these circular stone formations were used? Surely, the good Jesuit priest who designed it back in the 16th century had some purpose in mind. I mean, I do know they’re there to defend the walled city but my simple mind can’t understand the many circular formations. From what I gather, this part of the Walls went into disrepair and were in fact only rediscovered in the 70s. Forgive my ignorance, but I’m most certainly eager to know how that circular design work. 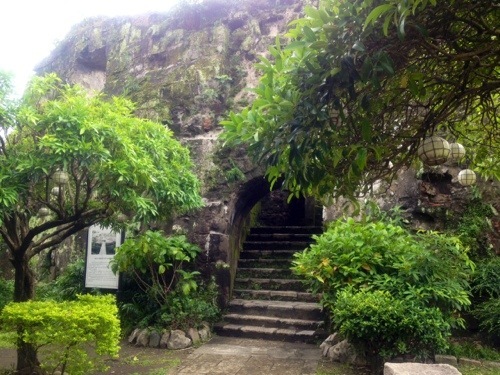 These days, the Baluarte (Baluarte means bastion or fortification) is more popular as a wedding reception venue. I wish it could be more than that. 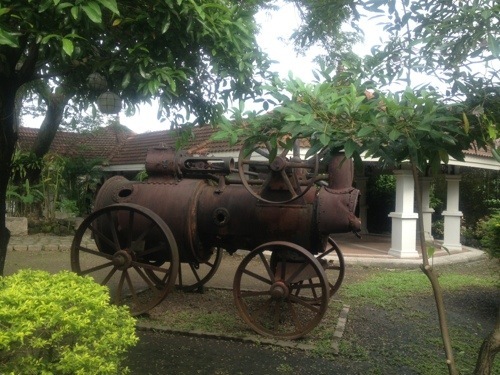 The place has so much history and is, in fact, a lovely “park” which children would enjoy. The only drawback is it could be really hot during summer here. 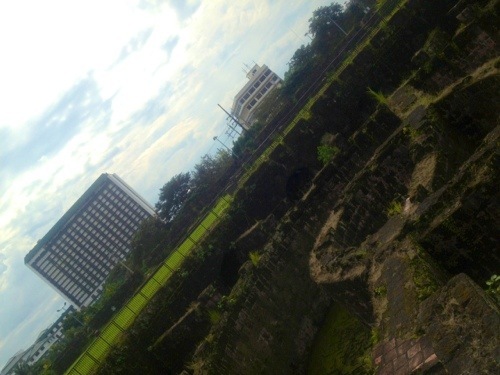 I sure hope the Intramuros Administration consider late afternoon and dusk tours here and around Intramuros. It will require some investment in good lighting and better security, but I’m sure tourists and even locals would enjoy the place better as the day approaches sunset and at night. 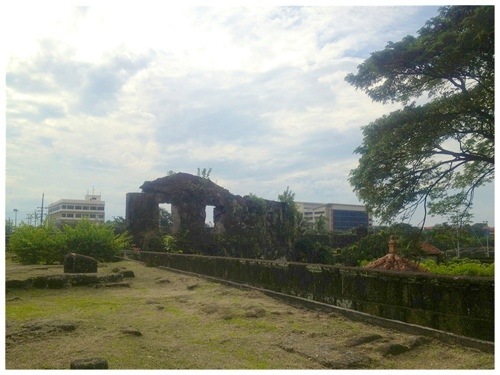 Play some good music too (like in Paco Chapel and Cemetery) and you’d turn the Baluarte more magical! The rental for this place is 28,500 plus electricity of 5,000 plus 10% of the price of the caterer plus they only allow 50 AMPS of electricity so in case you are exceeding it you would need to provide a generator. And the grand total price for this venue is 48,500. And they won’t provide any tent or platform. So guys and gals. What do you think? Is it worth it? Imagine if your caterer price is worth 1,000,000 and you get 10% of it. 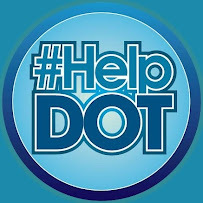 That is 100,000 plus 28500 for venue, 5000 for electricity and if u would get a generator that is 10000 which would sum to 143,500 just for the venue.